1869 brick and stone Hotel Pelham moved thirteen and a half feet to the right. European visitors to America in the Nineteenth and even Eighteenth Centuries remarked at how readily Americans moved buildings from place to place, even in rural areas. Economic explanations have been offered, relative costs of labor and materials, but a contributing cause is that the exact usage of the land was not at all settled in America, as it had been done long since in Europe. Major structures, like churches and meetinghouses, used to lumber here and there across the landscape, seeking out a comfortable place to settle. 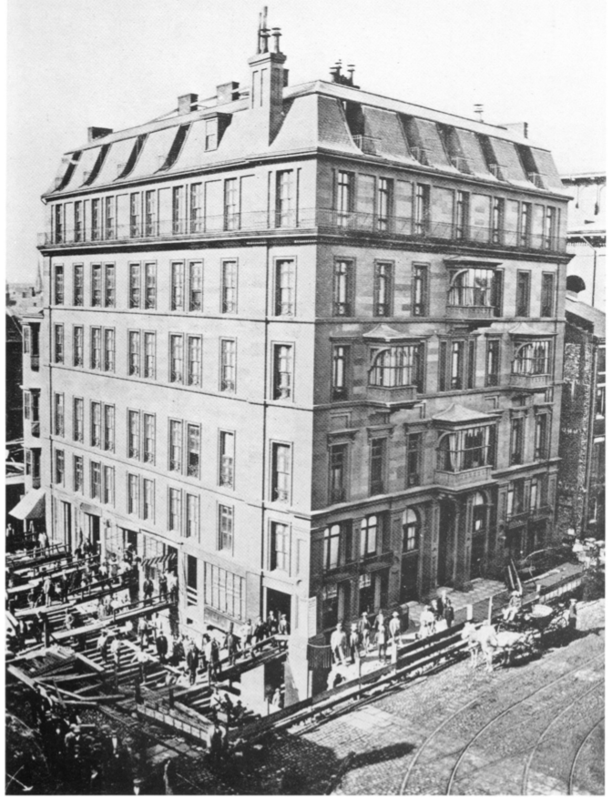 A notable engineering feat of this sort was the moving of the Hotel Pelham in Boston, in 1869, upon the occasion of the widening of Boylston Street. This was a notable project because of the scale and of the material. It was a seven story brick and stone building weighing over 6,000 tons. The goal was to move it a further thirteen feet off the street. The cost was deemed less than it would have been to remove the facade and rebuild it 13 feet back. As can be seen from the image, they have excavated around the perimeter of the building and have done so underneath as well, where they installed a system of rollers and iron rails and jacks to carry the entire mass. The Hotel remained open for the whole process, pictures hanging on the wall and the gas and plumbing supplied through a system of flexible tubes. All much to the astonishment of the Europeans. This entry was posted in Architectural Conservation and tagged Massachusetts. Bookmark the permalink. That is amazing! Thanks for sharing – I had no idea they used to move buildings so frequently.